Lower Platform Assembly (Figure 1): Attach lower side rails to the lower footboard making sure the machined holes face inside and the footboard's single pilot hole faces up. 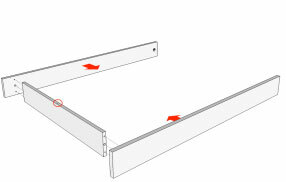 To attach the rails, follow the Rail Assembly Instructions. 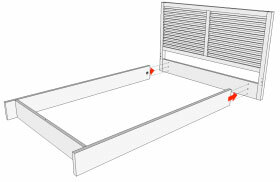 Now attach the assembled base rails to the bottom board of the headboard assembly (Figure 2), using the Rail Assembly Instructions. 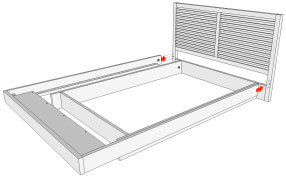 Upper Platform Assembly (Figure 3): Attach upper side rails to the long footboard only making sure the machined holes face inside and the offset holes are on the footboard side. 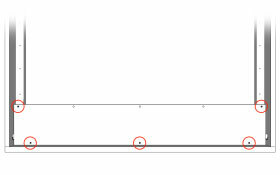 To attach the support board, align the holes as shown in Figure 4. Place 5 of the 1-5/8" screws into the pilot holes (circled) to attach. Do not use power tools. 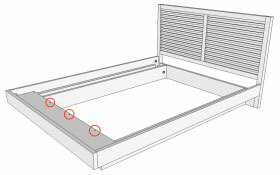 Attach the upper rails to the top board of the headboard as shown in Figure 5. Finish attaching the support board to the lower platform by inserting the remaining 3 of the 1-5/8" screws into the pilot holes as shown in Figure 6. 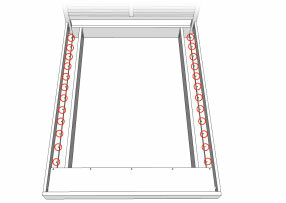 Align the holes in the metal slats with the screws (circled) in the rail cleats as shown in Figure 7. Screw the threaded rods into the inserts until it stops. Place the nuts onto the threaded rods and turn three to six times. 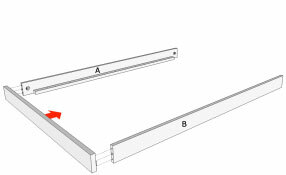 Install dowels into the rail. 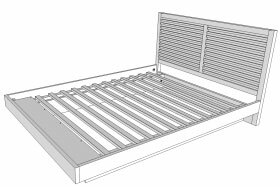 Slide the rail over the nuts and into the mating holes on the bed posts. Slide the metal collars in place as shown and tighten the nuts with the wrench provided.